Beckett's one-man play features protagonist Krapp (here performed by Beckett expert Barry McGovern) at the age of 69, recording his annual birthday reel-to-reel tape and listening to a recording made 30 years before, which in turn references one made 12 years before that. As Krapp's memories come back, so do regrets. Beckett's plays have maintained their iconic status thanks to the attitude of his estate, which insists on an austere interpretation that respects the intentions of the author. Consequently, the quality of each production depends not on a director's interpretation but the actor's ability to claim Beckett's script as his own. Through his tapes and dusty ledger, Krapp relives his younger self's birthday ritual (eating bananas, their yellow peel bright against the black painted set) and lost love. The uncomfortable clatter of the metallic tape boxes thrown to the floor could easily be the echo of Krapp's stinging memories coming back to the surface. 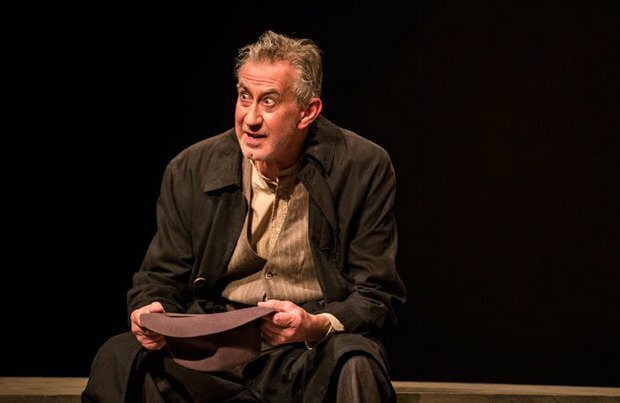 McGovern's memorable performance revels in lingering moments of silence and his emotional interpretation easily fills the stage, successfully bringing Beckett's words to life. Funny and wistful, haunting and meditative, Krapp's Last Tape is without doubt one of the highlights of this year's International Festival. Church Hill Theatre, until 27 Aug (not 22), 8pm (also 3pm 19 & 20, 24, 26 & 27), £25.